Fully self-contained, these units are ideal for couples - all have queen size beds, a fully equipped kitchen, flat screen television and DVD player and cosy underfloor heating. Our studios are each named after a Tasmanian wood, with the kitchens decked out in their namesake! Huon Pine, Sassafras, Blackwood or Tasmanian Oak. 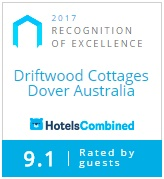 Situated on the waterfront, each cottage has its own balcony with spectacular views across Esperance Bay and the islands of Faith, Hope and Charity.